On June 20, 2003, Tsvi Goldstein and his wife Michal were driving from their home in Yishuv Eli to Jerusalem. Traveling with them were Tsvi's parents, visiting from the United States to celebrate the wedding of David, Tsvi and Michal’s son, which took place only the night before. Their joy was cut short by a hail of bullets, as terrorists attacked their car from the hill above. Tsvi was killed instantly. His parents were badly wounded and his wife injured. Their lives would never be the same. 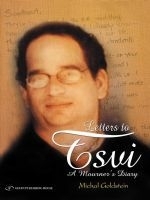 Letters to Tsvi is a compilation of letters written by Michal to her husband in the aftermath of the terrorist shooting. It begins with her experiences in the hospital, and continues through Tsvi's funeral, the mourning period, and beyond, chronicling the challenges Michal must face as she puts her life back together in a new reality, without her beloved partner by her side, but with hope for the future. A powerful, poignant, and intimate book, Letters to Tsvi shows us what the television news cannot – a personal view of the bereaved victims of terrorism.